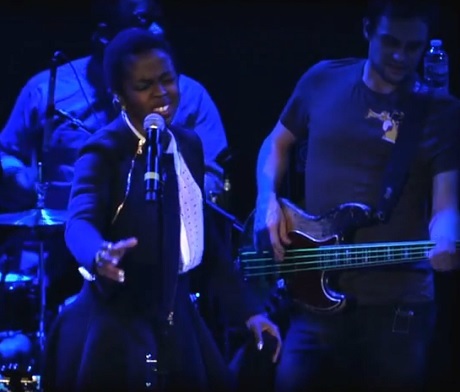 Since there's still really no telling whether Lauryn Hill will ever follow up her 1998 solo debut The Miseducation of Lauryn Hill, fans will have to settle for the occasional single or rare live appearance. Thankfully, both are always a treat, with the latter evidenced by recently premiered footage of Hill rocking a New York crowd with a revamp of her classic "Ex-Factor." The bedroom boom of the original was recast at the Bowery Ball Room with more of a rocksteady feel, with a full backup band supporting the singer's inimitable smoky coo. While the song has Hill noting of an on-the-rocks relationship "it ain't workin'," this extended jam out, replete with scorching guitar solos, certainly is. You'll see her conjuring up all sorts of emotions and showing off sky-soaring vocal acrobatics throughout the heart-swelling performance down below.